Disclosure: Nuby sent us the Flip-It Easy Grip Cup to review. All opinions expressed below are my own. Summer is on the way, and with a two-year-old in our family, that means we have a lot of adventures ahead of us. Trips to the park and the zoo, backyard playtime, and probably other fun stuff will come our way. Lincoln only has one speed (running), so my job this summer is going to be keeping him hydrated! 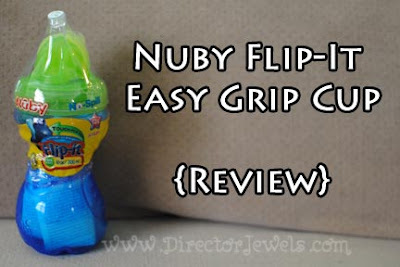 We had the chance to check out the Flip-It Easy Grip cup from Nuby, and it is a great addition to our sippy cup collection. This cup features a super easy-to-use flip top cap, which makes it a perfect cup to take along on our adventures. No worries about spills on the carseat or Lincoln's clothes - and if it happens to drop into a pile of dirt or something like that, the straw won't be contaminated. I definitely am not going to have time to worry about rinsing off a sippy cup every time Lincoln lets it fall to the ground. 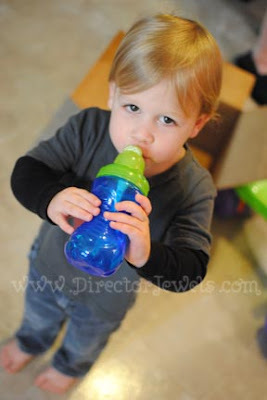 This no-spill cup design holds 10 ounces of liquid, which is just about right for my toddler. If he has too much more than that, it's unlikely to stay cold by the time he can drink it all! Lincoln loves the straw feature and is constantly wanting to play with the flip-top. He's not as confident using a straw sippy (he tends to tip the cup upside down, thus sending all the liquid away from where the straw will find it), but I think he just needs more practice. We'll definitely take care of that this summer! 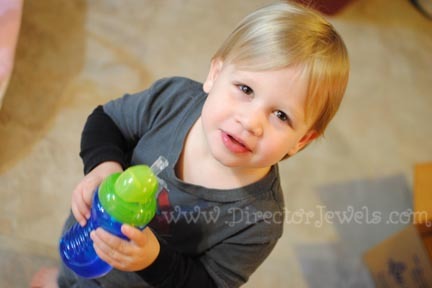 Nuby products are always BPA free, so my mind is at ease when Lincoln uses this (or any) Nuby cup. The Flip-It Easy Grip is a success at our house for sure! 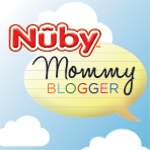 You can find the Nuby Flip-Top Easy Grip at Buy Baby Direct, Diapers.com, and Amazon - as well as Walmart, TJ Maxx, DD's Discounts, and Baby Depot at Burlington. Make sure you follow along with Nuby on Facebook, Twitter, Pinterest, and Instagram to keep up with all the latest products and promotions! I love the grip on this! Perfect for little hands! We have one of these and my kids love it! My little one is getting to the point of needing one of these! Thanks!